Every DU-HA is custom designed to fit a particular model of truck. 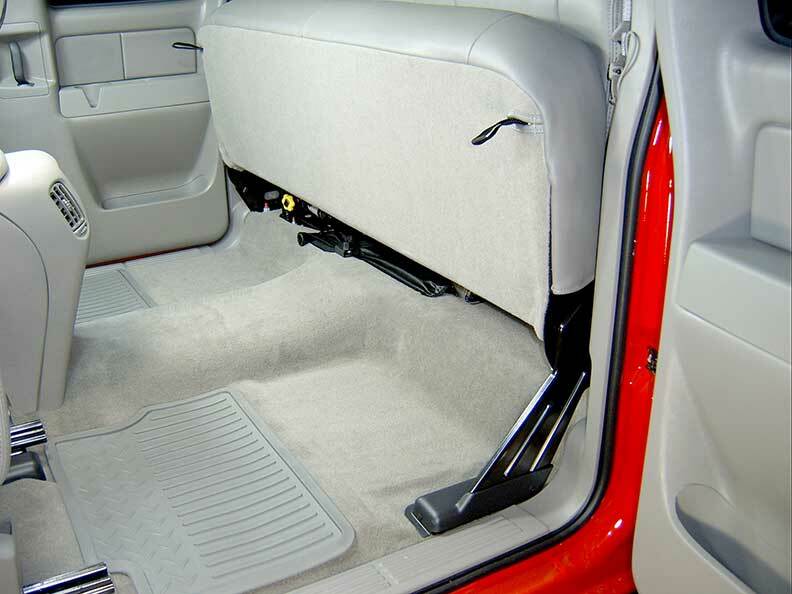 The Chevy/GMC Extended Cab DU-HA is designed to fit underneath your pre-existing back seat. It's constructed from heavy duty polyethylene and comes with a lifetime warranty. This model also acts as a legal gun case in most states and will hold up to 4 rifles or shotguns, 2 with scopes. On this model of truck, you have to open the front door to open the back door. The front doors open the opposite direction of the back doors. The back door only opens partially (it does NOT swing open all the way to the truck bed). Also, the side windows in the back seat do NOT roll down. *Does not fit 06-07 (Classic) 5'8" extra short box model. Make your back seat into a safe. Seat locked using the optional custom black DU-HA lock kit. Holds 4 rifles or shotguns, 2 with scopes. Acts as a legal gun case in most states with seat latched down. The DU-HA will store guns in cases...even a hard case. Comes with dividers & gun rack. DU-HA shown with dividers and organizers/gun rack installed. The DU-HA is divided into separate storage compartments with the standard organizer/gun rack and dividers in place.